six years ago, i ventured abroad for seven months. i did a study abroad program in switzerland, and afterwards traveled around europe, spent a month working as a chef at a surf and yoga retreat in portugal, and then visited some egyptian friends and joined on their vacation to dahab on the sinai peninsula. after several weeks in egypt, i met up with my best friend in turkey for two months of trekking and sleeping in tree houses and bivouacs. it's pretty wild to think back to this time in my life, when at the age of nineteen i felt confident enough to travel independently. maybe naiive is more fitting. i honestly don't think i have that same courage now, to travel alone. or maybe it's that i know how much more enjoyable it is to have a travel partner with similar interests and energy! nevertheless, i've been itching to travel again and was recently looking back at old photos from this trip. photos that i can hardly believe are now six years old! one photo, brought me back to a morning in dahab. i had woken up early to call my grandfather (he had given me one rule to follow: "travel. but always come home") i sat on the beach, looking out across the red sea to the shores of saudi arabia and told him all about egypt. once my friends woke up, i joined them for breakfast at one of the many sea-side cafes. this is where i first had shakshuka. a dish of eggs baked in a stew of tomatoes, onions and peppers served with crusty white bread to sop up the juicy stew and runny yolks. it was so divine, i think i ate enough to last me until dinner. 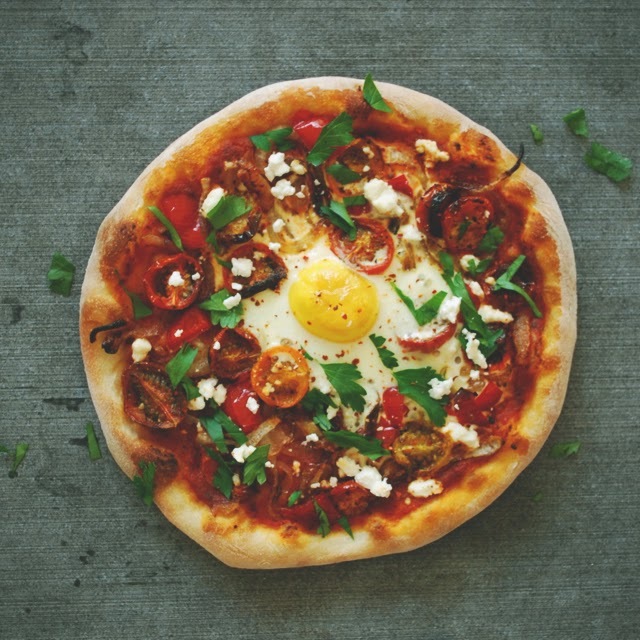 the photo and daydream inspired me to make a shakshuka pizza with the dough that had been rising for the past 24 hours on my kitchen table. preheat oven to 500 degrees with the pizza stone in the center of the oven. in a small bowl, combine pizza sauce with cumin and paprika. set to the side. slowly saute onions in 2 tablespoons of olive oil, over low heat in a cast iron skillet for 30 minutes. stir every 5 minutes or so until caramelized but not too browned. cut tomatoes in half and coat with 2 tablespoons of olive oil. pace cut-side up on a baking sheet and roast in pre-heating oven for 10-20 minutes until juicy and browned. let cool. you can either make two personal size pizzas, or one larger pizza to share. (see notes below on stretching dough). build pizza on peel, one at a time. top with a thin layer of spiced pizza sauce. scatter the onions, peppers, tomatoes & feta and gently press toppings into the dough. slide pizza onto the baking stone, and then crack one or both eggs onto the pizza. bake until crust in browned and egg whites are cooked through. 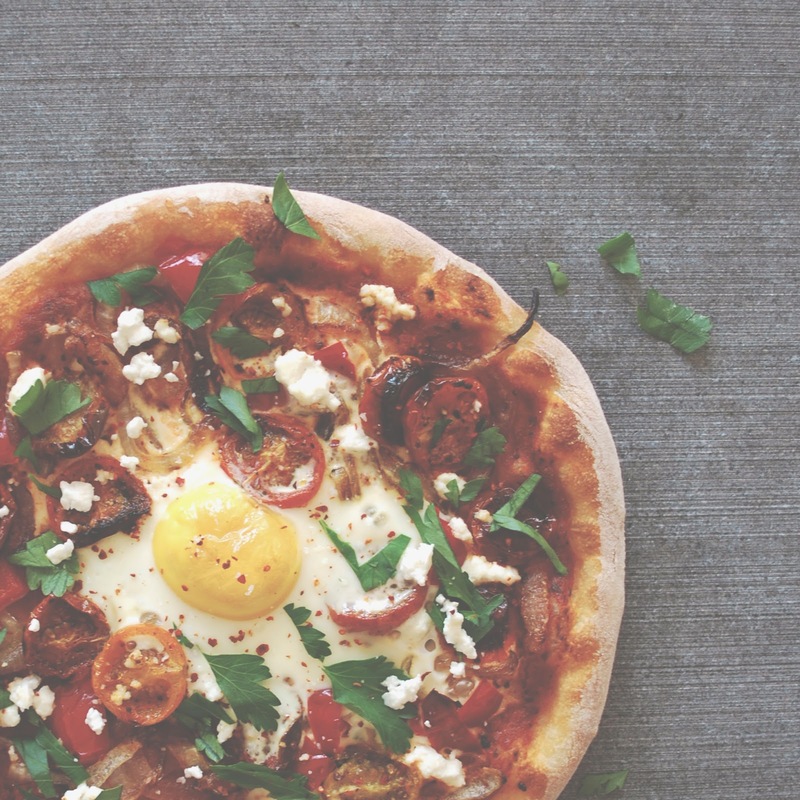 if you want a runny yolk, you may want to let your pizza get a few minute head start on baking. remove from oven and top with fresh parsley and aleppo pepper. repeat for second pizza. to make dough, mix yeast with water and oil in a very large bowl and stir to dissolve. weigh flour and salt together, and add a cup at a time into the water/yeast mixture. start with a whisk to stir until it becomes pancake batter consistency. 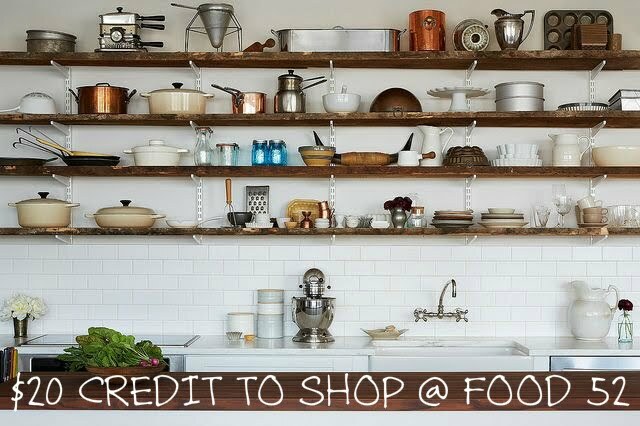 as you continue to add flour, switch to a wooden spoon. continue to mix until fully combined. do not kneed. 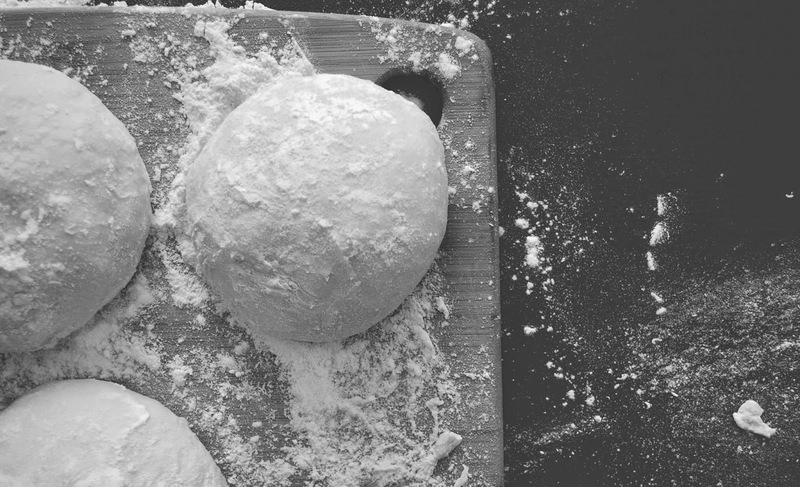 form into a dough ball-ish shape, and drizzle with a tablespoon of olive oil. rub with hands to coat the surface of the dough. cover with a dish towel, and let rest for 18-24 hours. once the dough has proofed, turn out onto a floured surface. gently kneed for just a minute, adding flour until the dough becomes less sticky. portion into four even parts and form into smooth boules. let rest for on a floured surface, covered with a towel, for another hour. copyright © drum beets. all rights reserved. Simple theme. Powered by Blogger.